The first thing to consider when selecting outdoor furniture is the material. Let’s look at a few of the options and weigh the advantages against the disadvantages. Plastic and Aluminum. Lightweight, rustproof, easy to clean, and inexpensive are some of the top selling points of plastic and aluminum. However, they are not very sturdy or durable and therefore do not generally last more than a few years. Synthetic wicker is robust and can withstand the elements. Some disadvantages are that wicker can be bulky, costly to repair if damaged, and it will require treatments every few years to keep it weatherproof. Wrought Iron. Wrought iron is an attractive, solid, and strong option, but it does require some upkeep as it is neither weatherproof nor rustproof. There are many varieties of natural wood to choose from. It’s a rugged material that can hold up for years. However, it will need regular upkeep with stains and sealants to protect against fading, splintering, and warping. With an expected lifespan of 50 years, polylumber is perhaps the longest lasting option. It withstands temperature extremes and does not absorb moisture, so mold and mildew aren’t a problem. It’s only disadvantage is that polywood is slightly more expensive than its natural wood counterpart, but the extended lifespan more than makes up for the additional cost. It may be tempting to skimp on quality with the rationale that outdoor furniture is not used as often as indoor furniture. In reality, quality is of the utmost importance as the furniture must withstand a beating from sun, gusting winds, and heavy storms. Craftsmanship is another factor to consider. Is the furniture mass-produced or handcrafted? Furniture made in a factory may be good quality, but it will not have the attention to detail that a handcrafted piece will. Sturdiness and durability are two important components, but also consider the maintenance of the pieces. How easy are they to clean? Will the furniture require periodic treatments to prevent fading, rusting, warping, or rotting? Are the pieces easily stored in the winter or are they able to withstand the elements? 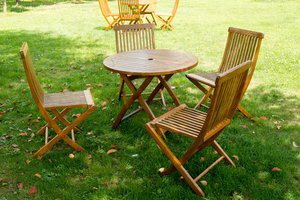 Some furniture manufacturers offer long warranties on their outdoor furniture. This indicates the manufacturer has confidence that its product will stand up to the test of time, and the warranties also offer the consumer peace of mind knowing that their investment is protected. When selecting outdoor furniture, keep in mind that it’s an investment as much as your indoor furniture. Weigh price against lifespan of the materials, consider the craftsmanship and upkeep, and when in doubt, take advantage of the warranties offered so that you can enjoy your pieces for years to come.